Today I received an incredibly haunting book trailer from New York Times bestselling author Wendy Corsi Staub for her upcoming release of NIGHTWATCHER. 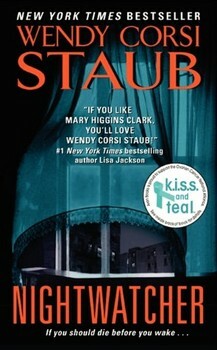 Staub is the New York Times bestselling author whose thrillers have a wide following. This is the first installment of a trilogy featuring Allison Taylor, a sympathetic heroine from the Midwest determined to overcome her start in life and conquer New York’s fashion world. The book opens on September 10th, so the setup couldn’t be more powerful right in the opening pages. What happens after the shock of 9/11 spins a new angle on those horrendous days, when a murderer is cut loose on a town already trying to comprehend the enormous tragedy they are living through. Allison has few friends but does talk to several renters in her apartment building: her upstairs neighbor, Kristina, and a young man, Mack MacKenna, whose insomnia finds them sharing the front stoop before the events that will change everyone’s lives so dramatically. Mack’s wife perishes in the disaster, and as Allison reaches out to help him cope, Kristina is found savagely murdered. Allison’s carefully wrought existence in her adopted city falls apart even more than the buildings that have crashed to the ground. As more women die at the hands of a mad serial killer, it becomes apparent that Allison is the only one who can identify the killer. With her life in danger, Allison tries to help catch this crazed madman, even as she realizes she could be his next victim. Getting inside the minds of many of the key players broadens the action and put the reader right into the thick of the tension and escalating terror. The action never lets up and the results are startling. There’s plenty here to keep you turning pages, and the ending will leave you waiting for the next installment, SLEEPWALKER, coming this fall.